Skin is a complete U-turn to my last few reads. 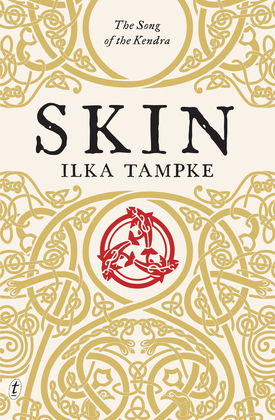 Those that know me, know that I’m an ancient history geek, so when I threw my name in the ring to win a copy of Skin from The Reading Room, I was pretty pleased when it landed in my postbox! Ailia is a young orphan girl who lives in Iron Age Southwest Britain, on the cusp of Roman invasion. She has no ‘skin’, no ancestry, or family history but is lucky enough to be raised by cook mother, who found her as a baby at her door, let her suckle on her dogs teat to survive and grow up to work as a maid to the tribequeen. Ailia is smart and headstrong and we follow her as she grows into a young woman, constantly searching for her ‘skin’ and find her place in the tribe. Is she skin to the salmon? The deer? The dog? How will she learn who she is? She is headstrong, wily, and independent, but will all these things help her find her skin? Or will she find something other? I loved reading about life in Iron Age Britain. The story is not based on fact, but I love the attention to detail that Ilke Tampke put into to researching how life would have been back then. Women had an important role in the villages and I loved the tribequeen and the knowledge of herbs and roots which were used to season, taste, and heal. The two men who fight for Ailia's love are red-blooded warriors and hold the book together with a smooth pace, and wild adventure as I felt the long summer days and cold nights of Caer Cad. Another book with a strong female character that keeps her femininity and her smarts. A really good read for any historical bookworm. Sign into Goodreads to see if any of your friends have read Skin.